Skylight sizes determined solely by manufacturer and there are no strict standardization exist. Skylights are available in number of shapes and proportions between width, length and height is not a limited parameter. Most popular rectangular fixed or venting pan-flashed with flat tempered glass skylights range from 14 to 72 inches (36 – 183 centimeters) in width and from 16 to 96 inches (41 – 244 cm) in length. Every producer offers its own minimum and maximum modular dimensions. For curb mounted skylights inside and outside curb dimensions are defined. Typically the difference between two of these measurements stay within 2 – 3 inches. Distance between lowest point on the sides and highest in the middle of dome skylight known as a dome rise. Typically bigger skylights have higher rise and it can range from 3 – 4 inches in 16”W x 24”L skylight to 12 – 14 inches in 60”W x 72”L skylights. Tubular skylights normally do not exceed 22” in diameter, but most of them made 14 1/2” wide for perfect fit in between two rafters and ceiling joists. For the installation purpose actual skylight size doesn’t mean much of value and the only measurements should be taken into account is rough opening or exact size of a hole which has to be build in the roof for proper installation. Venting deck mounted 21” x 46” wood with aluminum clad skylight weight about 60 lbs (27 kilograms). Materials the skylight made of and actual dimensions will determine the weight. Some bigger skylights are very heavy and weight can easily exceed 150 pounds. Thickness of glass used for skylights normally varies from 1/8” (3.2 mm) to 1/4" (6.35 mm). Bigger skylights typically contain thicker glass. But thickness itself is not the only parameter which defines the strength and energy efficiency. Skylights which made of two tempered or laminated glass panels and argon gas in between will perform much better in term of energy efficiency. Total thickness of dual-glass panels including gas space might go up to 1 inch (25 mm). 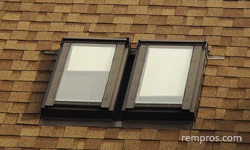 Many single glazed skylights made of Low-E (low emissivity) glass for increasing thermal efficiency. While shopping for a new skylight always check specifications because there are often maximum pitch restrictions. Some skylights can be installed on the roofs which are nearly vertical while other can be limited to roofs with 45, 60 or 85 degrees pitch. Before purchasing a skylight always check building codes in your area. Heated-strengthened tempered glass might be prohibitive for residential applications if the distance between a floor and skylight exceed 10’. While building custom home skylights in the shape of pyramid, rounded, triangle or which installed on the ridge in odd sizes can be ordered directly from a manufacturer or distributor. Design, style and dimensions will define the time necessary for completing and shipping the order. On average expect to wait about one month for home delivery.